Production of a movie is underway this year. To see a short video on JACK AND LEM (click here). NPR Interview with David Pitts (click here to listen to a 30-minute interview about the book on NPR's Book Talk). --In the fall of 2017, David appeared on a nationally-televised PBS special on JFK titled, "The House That Jack Built." A DVD of the hour-long documentary is available from WCVE TV in Richmond, VA.
-- Publishers Weekly (March 19, 2007 edition) calls Jack and Lem "thorough" and "well-done." --An article in Harvard Magazine (September-October 2007) notes that "journalist Pitts has written a Kennedy book with something new to offer." --Harvard Magazine names Jack and Lem one of the "notable" books of the year in its September/October issue. --The Advocate Magazine named Jack and Lem one of the five best books of 2007.
and his incredible friendship with JFK"
John F. Kennedy and Lem Billings. The Untold Story of an Extraordinary Friendship. John F. Kennedy's best friend for three decades was a gay man, according to a new book titled, "Jack and Lem: John F. Kennedy and Lem Billings. The Untold Story of an Extraordinary Friendship;" the book documents the relationship between the two men from its beginnings at a New England prep school in 1933 until the gunfire in Dallas in 1963. The evidence presented indicates that Jack found out that Lem was gay early in the friendship. Despite his own heterosexuality, however, Jack didn't reject Lem. On the contrary, the friendship grew and survived against the odds. Though much has been published about Jack Kennedy over the years, little has been known about his enduring friendship with Lem until now. 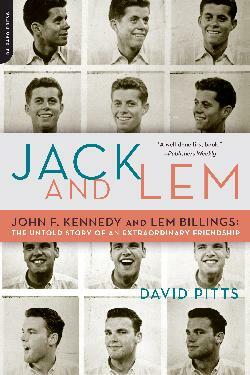 Author David Pitts tells the story with the aid of hundreds of letters and telegrams exchanged between Jack and Lem as well as previously unavailable documents that were placed in the John F. Kennedy Library in 2003 and accessed for the first time with the cooperation of Robert F. Kennedy, Jr. Featuring interviews with Ben Bradlee, Gore Vidal, Ted Sorensen, friends, family, and many others who knew Jack and Lem, the story begins with their early years at school, follows their relationship through Princeton, Europe, World War II, Kennedy's rapid political ascent, and his time at the White House. Over fifty photographs illustrate the book, most of which are of Jack and Lem at various stages of their lives and have never been seen before by the public. Even though Lem was a personal friend and never held a position in the Kennedy administration, Jack valued Lem highly enough to discuss with him the great events of his presidency, including the Cuban Missile Crisis of 1962. There is new political information in the book about how JFK really viewed LBJ and other leaders, about his anger with the CIA and the Joint Chiefs of Staff, and about his reluctance to commit American armed forces in various conflicts. While Jack was president, Lem even had his own room at the White House and was there most weekends. The book also details the effect of Jack and Lem's close friendship on the president's marriage. Although Jackie Kennedy liked Lem, she was sometimes frustrated by his omnipresence. "He has been a houseguest every weekend of my married life," she told the White House usher. The author paints a profile of a richly textured friendship set against the backdrop of some of the most remarkable events of the twentieth century, a time of unparalleled idealism but also of rampant homophobia. The book concludes with a chapter on Lem's life after Dallas when he admitted he had loved John Kennedy deeply. "Jack made a big difference in my life," he said. "Because of him, I was never lonely. He may have been the reason I never got married." Crushed by the assassination, Lem became a much-diminished man in his final years. �Jack made a big difference in my life. Because of him, I was never lonely. He may have been the reason I never got married. I mean, I could have had a wife and family, but what the hell � do you think I would have had a better life having been Jack Kennedy�s best friend, having been with him during so many moments of his presidency, having had my own room at the White House, having had the best friend anybody ever had � or having been married, and settled down and living somewhere.� Lem Billings. �Of the nine or ten men who were close to the president, I would say Lem was number one�It�s hard to describe it as just friendship; it was a complete liberation of the human spirit. I think that�s what Lem did for President Kennedy.� Eunice Kennedy Shriver. �Lem�s raison d�etre was Jack�What was the connection? I think they both shared the same understanding of what life was all about.� Charlie Bartlett, journalist, the man who introduced Jack and Jackie. �There was a lot of love in him that he bestowed on many people, but the one person he loved most was torn away from him by an assassin�s bullet.� Sigrid Gassner-Roberts, Lem�s live-in assistant during the early 1970s. �Lem helped me see a JFK that no amount of books, films, tapes and recordings could reveal�If you someday see my completed portrait of John F. Kennedy, look a little closer, for under the surface of the paint is a portrait of Lem Billings.� Jamie Wyeth, artist. �I was at his house every single weekend he was president�Jack was the closest person to me in the world for thirty years.� Lem Billings. Listen to the President Kennedy and LeMoyne Billings phone conversation (September 1962).